Eleanor Bourg Nicholson’s new novel A Bloody Habit puts some new teeth into vampire stories, being a unique tale in which evil is actually evil and sin really is sinful. Nicholson, whose academic studies focused on English literature and anti-Catholicism in the British Victorian period, has been director of religious education at St. Thomas Aquinas University Parish in Charlottesville, Virginia since 2011. She has edited several Ignatius Critical Editions volumes and worked for the literary and arts journals Dappled Things and Saint Austin Review (StAR). Her epistolary novella The Letters of Magdalen Montague (2011) is available through the kind patronage of Kaufmann Publishing. My head was full of questions after reading Nicholson’s tale of vampires spreading their influence in Victorian England and Dominican friars making mysterious appearances. Nicholson graciously responded to my questions about horror stories, Dracula, werewolves, Bram Stoker, Dominican friars, and the similarities between today’s culture and the Victorian age. CWR: It’s difficult for contemporary fiction written by faithful Catholic authors to compete with fast-paced dystopian adventures and horror stories that glorify the occult (and other evils). Why do you write fiction? Eleanor Bourg Nicholson: My mother is an omnivorous reader, and passed that on to her children. My imagination was captured very early on by the books, stories, and poetry she shared with us. We seemed always to be reading and, as soon as I could do so, I seemed always to be writing. I’m still an avid reader, and have a particular fondness for British fiction written between 1790 and 1930. My literary preferences certainly impact my writing, as does my Faith. It’s a complicated idea—that of “The Catholic Writer”—and one that has sparked a lot of debate in both academic and artistic circles. Most of my personal thoughts about it are developed post hoc; a fledgling story emerges in my mind, I work to develop it, the characters and narrative frame take over—and in the end I am delighted to learn what on earth the story is about, what it’s trying to convey. Inevitably my work is permeated with Catholic themes, and, so long as I don’t find myself becoming cheesy or preachy, I’m not concerned to eradicate open manifestations of “things Catholic”. The Gothic is hugely permissive on this point, actually, which lets me indulge some of my academic preoccupations, especially the relationship between nineteenth-century anti-Catholic literature and the eventual emergence of “the Catholic novel”. CWR: Every chapter in A Bloody Habit opens with a quote from Dracula. When did you read Bram Stoker’s account of the undead for the first time and what were your impressions? Nicholson: I first read Dracula in my late teens. It blew me away. 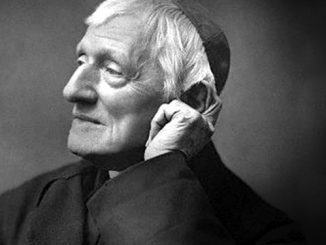 I was fascinated by the Catholic themes (thrown together so haphazardly by the Protestant Irishman, Bram Stoker) and the brilliant catastrophe of his creative style. In terms of strict literary merit, it’s a mess. But, to paraphrase an early reviewer: I have enough bad taste to enjoy the mess thoroughly, and even as I guffaw at the campiness, my skin is crawling and I am nervously glancing over my shoulder to make sure I am indeed alone—and safe! 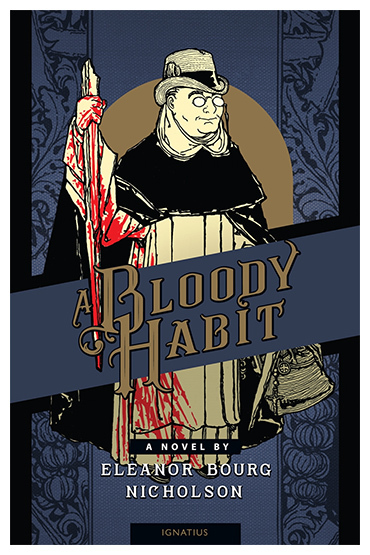 The novel has rather haunted me, emerging in my undergraduate and graduate endeavors, my scholarly work post college (including the Ignatius Critical Edition of Dracula), in Bloody Habit, and teaching high school literary classes for Homeschool Connections. Dracula is such a wonderful combination of entertainment and edification. It’s riotous good fun. CWR: Vampires and werewolves have become a source of fascination in young adult novels, movies, and television shows. Your book depicts them as creatures who completely given into sin and earthly passions, and lost their free will. Why do you write about vampires? Nicholson: I find that the trappings of the Gothic genre let me get away with a great deal. When I’m talking about a world beset by evil personified by revenants, I can talk about good and evil, redemption and damnation, the redemptive or destructive power of violence, hope in the face of horror, terror and passion (with Victorian restraint)—the sorts of things that I couldn’t possibly discuss in a more domestic genre without coming off as obnoxious and preachy. Additionally, like Stoker who threw off the comparatively new tradition of dark Romanticism in favor of more antiquated folklore, I abjure the Modernism corruption of the vampire. There are many degrees of culpability in my characters, especially those whose vulnerabilities lead to their victimization by vampires in one way or the other, but the central vampiric agency must, to my mind, be evil, or there will be an imbalance in the moral anthropology of the entire story. If evil isn’t evil, and sin isn’t sin, and vampires aren’t vampires, the thrill of the Gothic is reduced to lame angst. I find angst very boring indeed. 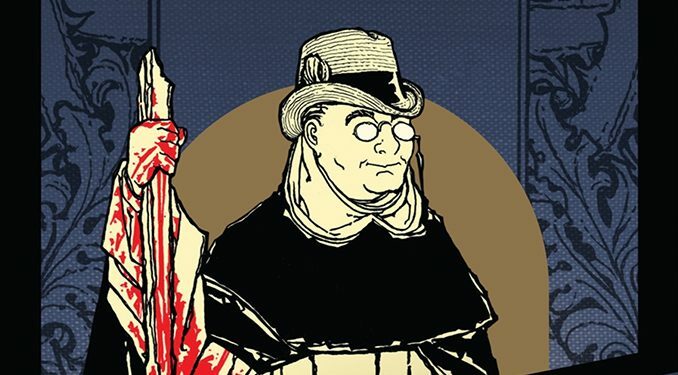 CWR: Despite the cover, which depicts a whimsical Dominican friar holding a bloody stake, the protagonist of your book is the skeptic John Kemp. Why did you choose to write through the first person point of view of someone who has lost his faith? Nicholson: That is the result of some deliberate narrative strategy. I needed a narrator/protagonist who would be relatable and believable—an Everyman who has appropriate feelings at appropriate moments. When you’re setting a Gothic scene, you have to draw the reader into accepting all of the fantastic trappings, inspiring what the poet Coleridge called “the willing suspension of disbelief”. It’s an asset to have a narrator who anticipates the reader’s rational objections from the start and says: “This is all nonsense!” With such a narrator, the reader can then unite in surprise, alarm, fear, and, eventually, hope and even happiness in the face of theatrical horrors. CWR: Fr. Thomas Edmund Gilroy is arguably most interesting character in your book. Can you tell us how he came to be? Nicholson: He arose in from a theory and a nightmare. Musing about Dracula about ten years ago I thought to myself that the best anti-vampire warriors would be someone like the Dominican friars I first came to know in my teens. 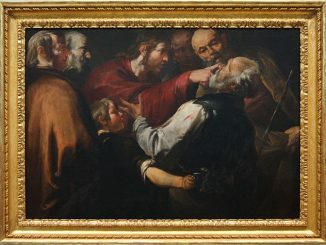 A Dominican friar is not alarmed by the theatrical preternatural; he engages daily and intimately with the supernatural. Battling vampires wouldn’t even be such a friar’s first job—Fr. Thomas Edmund is first and foremost a priest and secondarily a historian. His job as an exorcist and vampire slayer is almost a tertiary apostolate or duty. The second point of inspiration, as I mentioned, was a nightmare. In early November 2009, I was on a working retreat staying at a convent of Dominican nuns (working on various non-Gothic literary projects). 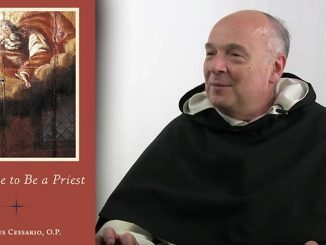 A friar I had known for years, Fr. Thomas Joseph White, came to teach the nuns a course—on Christology, I think. During the course of our conversation at dinner one evening, he recommended that I do something absolutely critical to a retreat—to take a nap. The following day I decided to follow his advice (though I’m not much of a napper). As I lay down to sleep, my eye fell on one of the few decorations in the room: Veronica’s veil, “the icon not made by hands”. It looked like a disembodied floating head against a gold background. It popped into my head that Catholics would be particularly adept at battling the preternatural because we are weirder than the preternatural. Then I fell asleep and had a nightmare of a secular, skeptical lawyer, a Dominican friar, and a vampire on a train. I awoke and wrote the first chapter of the novel. It’s partly dedicated to Fr. Thomas Joseph, who became one of my earliest readers and really assisted with his feedback, especially regarding the character of Fr. TEG. CWR: Unlike Stoker’s novel, violent and gory action scenes are limited in your book. Is there a reason? Nicholson: Ironically, I have felt that I indulged blood and gore more than Stoker, who assured Prime Minister Gladstone that there was “nothing base” in Dracula. There are in fact only a handful of really bloody or gory scenes in Dracula. Most of the violence happens off stage, as it were, and the high-profile victim count comes to five and a half—two of whom survive the novel. My body count is significantly higher, and some of the deaths are much more disgusting. CWR: The way you present evil and its spread through the society make the reader reflect upon the problems of today’s culture. What are some similarities between the Victorian world of John Kemp and the 21st century Western world? 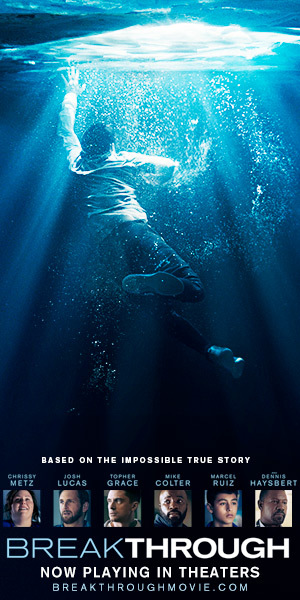 Nicholson: The French Decadent writer Baudelaire wrote: “The finest trick of the devil is to persuade you that he does not exist.” The skeptical and increasingly post-Christian world of the Victorian is mirrored in our own. Urban violence, occultism, superficial philanthropic schemes, rampant vice, the collapse of the family, the assault on procreation as the natural, God-ordained source of societal growth (the vampire uses predatory tactics to recruit in a plan for non-procreative, anti-natural societal construction)—those are all the heritage of the Victorian, and our own heritage today. 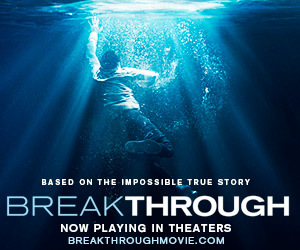 Man, deprived of the conviction that he is beloved by God, becomes prey to vice and, through that, becomes monstrous. Then, as now, I think man actually does believe in that monstrousness, because he lives with himself. The baffling thing isn’t really the problem of evil (though 21st-century man doesn’t call it that or acknowledge it); the baffling thing is the problem of the Good, and the utter incomprehensibility of the mercy of God. In the end, I rather think that’s what A Bloody Habit is about: Goodness in the face of the horror of this fallen world. And who shall be appointed to vanquish the neo-Gnostic revenant and architect of the anti-Truth? The Order dedicated to Truth and established to fight against 13th-century neo-Gnosticism. CWR: Both in Dracula and in A Bloody Habit, women are the first victims. Even though you part ways with Stoker in many aspects, you chose to keep women as primary targets. Why? Nicholson: That wasn’t precisely deliberate (I didn’t actually notice it until Karen Ullo, my fellow Catholic vampire novelist, pointed it out), though it’s pretty typical for Gothic fiction. In fact, I think that’s one of the things Count Dracula gets right! If you want to strike at the heart of society, take out the women! I have found that the women in my current book have more versatility in battling the foe, but since I am never convinced by scenes of 90 pound females taking down 180 pound men, the strength of the female characters in my new book isn’t likely to be shown in a Hollywood-approved manner. CWR: The vampire in A Bloody Habit meets his end in a much different fashion than Count Dracula. It seems like you wanted to correct Mr. Stoker. What are some of your main objections to Stoker’s Dracula? Nicholson: I have taught Dracula to high schoolers and one of the concluding projects we work on together is to assemble a list of ways that we could improve the Count’s strategy. A few of the really critical points for correction are: 1) A wider focus of attack (not just choosing your victims from a group of people who know each other! ); 2) A strong “front” or cover story, popularizing vampirism under the guise of something else; 3) A hierarchy of minions and dupes on which to build a really sinister plot for blood, vicious pleasure, power, and societal destruction. At times, Count Dracula feels like the moustache-twirling villain in a popular, cheap piece of Victorian theater. I wanted my villain to have a more sophisticated plot so the heroic triumph would be even more satisfying. (Incidentally, Stoker’s original ending of the novel included a glorious moment of geological collapse. I’m very fond of that ending.) I also wanted it to be spiritually intelligible. If vampires are evil undead creatures, they would properly be the concern of exorcists, not left to a motley band of eager but unqualified amateurs. CWR: Will we read more about the adventures of Fr. Thomas Edmund in the future? Nicholson: I think it is very likely. I have been so delighted by readers’ responses to Fr. Thomas Edmund. I tried to be very cautious and restrained in my use of him—he could so easily become campy, an obnoxious in-joke only comprehensible to Dominican groupies, or ineffectually preachy. But, partly encouraged by the readers of Bloody Habit, I have found that he intends to intrude on my current project in some capacity or other! A very good interview. Relevant questions and revealing answers. It is good to have an idea where an author is coming from. It’s also good to have a change, and it sounds like this book would provide just that. Derya’s conversion story was amazing. God’s providence coupled with the workings of grace: what a mystery. I admire Derya so much, for her honesty and fortitude. Thank you for your kind words, Stephen. I’m very happy to hear that my book was an encouragement to you. Blessings.